Since the 1850s, Green-Wood Cemetery has been a sculpture garden. Back then, there was little if any public sculpture in New York City or Brooklyn. If you wanted to see sculpture, you went off to Green-Wood to see it. And that tradition of Green-Wood as sculpture garden has continued: in 2002, we added the bronze Beard Bear, by Dan Ostermiller, and in 2006 we obtained, on permanent loan from the ASPCA, the circa 1955 bronze “Humanity of Man Before A Group of Ageless Animals,” by John Terken and Wilhelm Hunt Diederich. A model of MacMonnies's "Nathan Hale". There is no question that Frederick MacMonnies (1863-1937) was one of America’s great Beaux Art sculptors. He created the Nathan Hale monument that stands in City Hall Park. 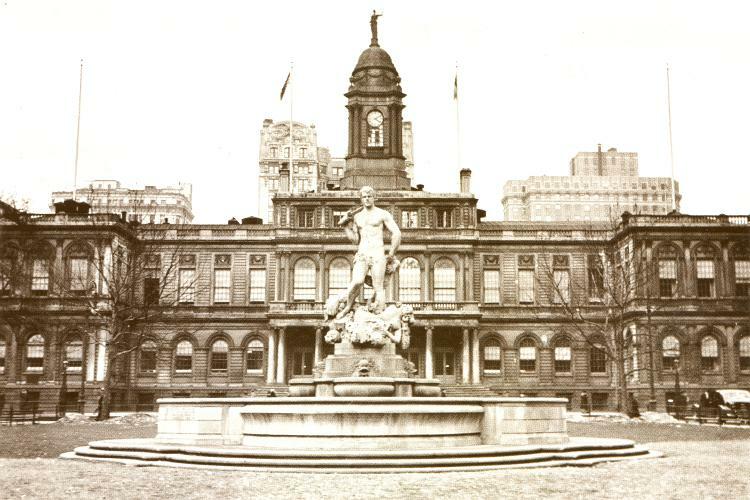 He also created “Civic Virtue,” a fountain sculpted by MacMonnies for City Hall Park. However, from its very beginning, it was controversial. 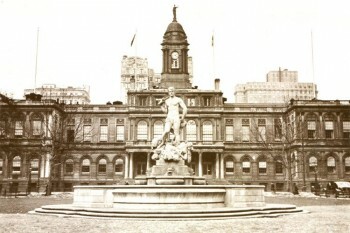 Though criticized as sexist, it was placed in City Hall Park in 1922. But it didn’t last there very long. "Civic Virtue" in City Hall Park, circa 1930. In 1941, Mayor Fiorello Laguardia, apparently tired of seeing “Civic Virtue’s” naked derriere every time he left his office, came up with a plan: he would give it to the Borough of Queens, in honor of the opening of its new Borough Hall. So out to Queens “Civic Virtue” traveled, and it has remained there pretty quietly every since, deteriorating year by year. It’s a bit of a mess–marble, uncared for, just doesn’t survive well outdoors, subjected to acid rain and car exhausts. Periodic efforts have been made to raise money to restore it–but it continues to deteriorate. Quiet, that is, until a few weeks ago. On February 25, a press release was issued with this spectacular headline: “Weiner, Ferreras Call on City to Sell Sexist Statue on Craigslist.” Really priceless! In their press release, Congressman Anthony Weiner and City Councilmember Julissa Ferreras describe “Civic Virtue” as “sexist,” “offensive,” and “misogynistic.” Others see it, perhaps more accurately, as allegorical, a depiction of Virtue (a male figure) standing in triumph over Vice (depicted as two female figures). 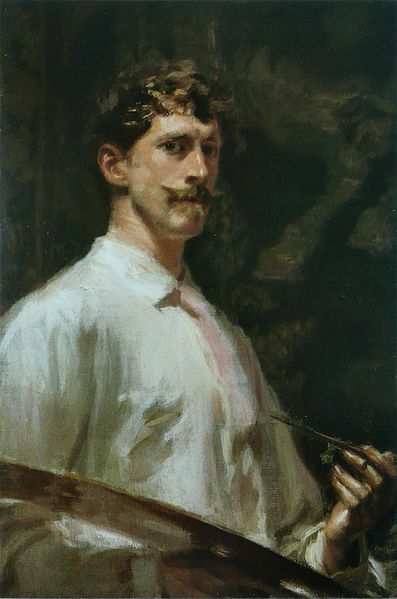 In any event, when Green-Wood’s president, Richard J. Moylan, heard about this controversy, he offered a solution: Green-Wood would pick up “Civic Virtue” (all 22 tons), give it a home amongst the work of MacMonnies’s contemporaries (including Daniel Chester French and John Quincy Adams Ward, sculptors whose work adorns Green-Wood’s grounds), and would even fix it up. As Moylan told the Daily News, “We could not stand by idle and see a major work by one of America’s greatest sculptors turn to dust.” A generous offer, it would seem. And, notably, MacMonnies’s father, mother, and brother, are all interred at Green-Wood in section 195, lot 25899; “Civic Virtue” would be joining them there. Was James Wall Finn your father?